While the recent panel discussion “Hydraulic Fracturing: Bridge to a Clean Energy Future?” fell far short of answering its title question, the conversation did reveal one essential truth about the state of this market-bending extraction method: uncertainties abound. No one yet knows whether a continued shift from coal to shale gas in the electricity sector would truly lead to any significant decreases in carbon emissions, or to what extent the climate benefits of any such decrease would be negated by fugitive methane emissions. No one knows if fracking will contaminate surrounding ground and surface waters, leading to the spoliation of unfiltered municipal water supplies that millions depend on in some of the most populous and economically vital regions of our country. No one knows the economic impacts fracking will have in the rural and often relatively poor regions where it is taking place. In fact, no one outside of the fossil fuel industry even knows the exact makeup of the proprietary chemical stews these companies are forcing into the ground. What we do know is that allowing the proliferation of fracking while nearly every burning question about the practice remains unanswered means throwing the precautionary principle to the wind. To let fracking persist under the current conditions of light regulation and lax oversight is to be complicit in this shortsighted and potentially neglectful exploitation of our energy resources. And to do so at the expense of increased investment in the research and development of true renewables approaches the indefensible. I do not necessarily agree with Bill McKibben’s sentiment that fracking, rather than being a bridge to a clean energy future, is instead a “rickety pier” leading us deeper into a hydrocarbon abyss. If done carefully, under a well-designed regulatory structure with strict enforcement and liability mechanisms in place, shale gas development could prove to be a critical part of a clean energy solution. But the risks of catastrophe remain far too high to discount or disregard. A lowlight of the event for me was the predictable truthiness of the panel’s representative energy insider, John Hofmeister. 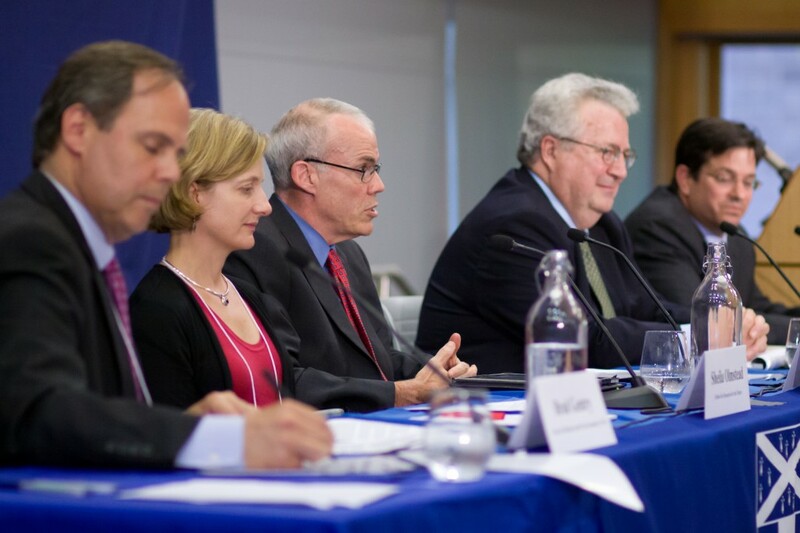 Unfortunately, and perhaps due in part to the event’s format, the double-talk of this former Shell Oil President turned cheap energy advocate was often ineffectively disputed by the other panelists. Hofmeister’s animated agreement with McKibben that there is “no place for private money” in the financing of public campaigns may have been the most robustly applauded line of the night. Hofmeister also went on to declare that so far as he knew, Shell Oil “did not make political contributions.” However, Shell’s own website explicitly acknowledges that the company actively “administers a political action committee… that contributes money to political parties or individual candidates for political office.” According to the Center for Responsive Politics, Shell Oil’s PAC has repeatedly contributed to the campaigns of Congress’ most outspoken climate deniers, including Senator James Inhofe and Representative Joe Barton. While the money for these campaign contributions comes from Shell employees, not from the company’s coffers, the corporation itself does retain a staff of over a dozen full-time lobbyists and reports enormous annual lobbying expenditures: over $14,000,000 in 2011 alone. Perhaps reasonable people can quibble over whether Hofmeister’s statements were technically accurate. There is no doubt, however, that Shell and its Big Oil allies flex tremendous financial muscle in order to influence the energy debate in Washington and advance policy proposals that further their business interests. But why should we expect anything but double-talk from Hofmeister? The man reigned as President of a company that is hiding behind its corporate form in an attempt to shirk liability for its involvement in human rights atrocities against environmental activists in Nigeria, yet he declared with a straight face that the modus operandi of every energy company was to first “do no harm.” Hofmeister’s half-truths were disingenuous, if not deliberately misleading, and should have been more vigorously refuted on the spot. Granted, participation in this panel was tough duty for Hofmeister. It was an undeniably bold move for a former oil executive to share a dais with Bill McKibben in Kroon Hall. The audience seemed to recognize this dynamic, and gave ample deference to his perspective. At times, Hofmeister even elicited signs of clement approval from the crowd with his mildly witty though entirely inapt analogies to factory farming and religious proselytization, and with his aforementioned plug for campaign finance reform. Perhaps in lieu of this superficial largesse Hofmeister could have better used his opportunity to address an audience of self-identified environmentalists by sharing some of his technical expertise. Many who are already well versed in the policy debate over fracking would surely benefit from a more complete understanding of the state of the current science, and of the technologies and policies being deployed and developed to help reduce the environmental impacts of the drilling process. Hofmeister approached the conversation from this angle once or twice. He briefly mentioned a novel brine treatment method and referenced some unspecified casing and threading improvements, but leaned more heavily on tired old arguments about the short-term cost benefits and predestined permanence of our carbon-addicted status quo. This seems an ineffective strategy for winning over those of us who think about the impacts of climate change in generational, if not geologic, time scales. His approach left me with many questions about the technologies he mentioned, but little reason to assign credibility to the answers he might offer. Bill McKibben, a favorite son of the climate movement, turned in a more honest, though also decidedly uninspired performance. His focus seemed to be almost entirely on the climate consequences of a shift to shale gas, but he largely ignored other potential environmental impacts. As someone whose childhood home in suburban New York lies just a few hundred feet from one of New York City’s reservoirs, surface and ground water contamination from fracking seem a more acute concern –– especially since preliminary studies suggest that this type of contamination has already occurred, while information about greenhouse gas emissions from fracking remains fuzzy. McKibben is certainly a brilliant thinker when it comes to climate policy and campaign advocacy, but he did not do much on this night to engender any additional support from an already sympathetic crowd. Ultimately, McKibben and Hofmeister represent the polarized termini of an increasingly nuanced debate. The academics on the panel, environmental economist Sheila Olmstead and hydrology professor Jim Saiers, did well to present the moderate perspective that is more representative of Americans at large. They articulated a sensible, albeit loosely defined, policy approach to pursue moving forward: a careful, methodical approach that entails spending significant time and money gathering unbiased and verifiable data on the lingering uncertainties about fracking, and then determining whether and under what regulatory framework its continued expansion would result in a net benefit to society. The event’s top performer was its moderator, Professor Brad Gentry, who did an excellent job allocating equal time to each panelist and gently guiding him or her towards the gist of their argument. He also came closest to expressing the crux of the conversation when he asked Professor Jim Saiers about the gap between existing fracking policies and accepted science. Gentry alluded to the simple reality that sound policy requires sound science. The contemporary debate about fracking is being framed not by an understanding of the science, but by the end-game policy objectives of powerful stakeholders on both sides. A great deal more impartial and well-targeted research must be conducted in order to determine whether shale gas can truly act as a bridge fuel to a clean energy future. Considering the stakes, it would be folly to continue down the present policy path without a greatly improved scientific understanding of the consequences.